the remote control is MINE. This entry was posted in Babblings, Beatnik Poetry Slam, Deep Thoughts and tagged babblesomeness, Beatnik Poetry Slam, beret, clap clap, daddyo, ray bans, sonny and cher. Bookmark the permalink. Gotta set the scene, so the man can see what it’s all about, Amor24! Not a problem – in our house, we split dishwashing duties, WG. Fortunately, I’ve never actually been to one of these, Magsx2. I have to ask – was there a 2nd date? Thanks, William Lawson. Sometimes, this stuff just writes itself. Cool – I will wear a beret today in your honour. Thank you, gingerfightback. I will be playing a banjo in yours. If only I was successful at any of them, whiteladyinthehood! Especially the poetry and limericks. Awesome! But, everybody knows the remote control always belongs to the woman-she will just let you think it is yours. I let her think that I’m thinking that she thinks that I only think that it’s mine. Forget reverse psychology, GingerSnaap. We’re using quantum psychology! I admire people who can do things which I can’t…. I can definitely wear a beret though, and quite well! Only the hippest among us can rock a beret, Alex! Ohh I dig. Snaps all around. You’re a cool bird, Lily. I never pictured you with a beret. And please don’t start to now, sandylikeabeach. I’m a baseball cap and Outback hat kind of guy. Oh, and fun ski hats. you are one hep cat daddy-o. fun piece. dig it man! Everyone knows the hippest scene is in Reno, hosted by the coolest Kitty Cat there is, Miss B! Let me know when you’re putting it on and put me down for a ticket, Whitney! I think you have it in your soul, kayjai. Oh, so good. I dig it, man. You are hip to the scene, jell jell. Can’t wait for EB’s baby beatnik debut! I DEFINITELY dug this one! The struggle for control of the remote can only be fully expressed in dark smoke filled speak-easies, The Hook. Hey, man, those are some groovy lines! Like, really hip. I dig what you’re doing here, Clyde. Yeah, having nothing better to do really is the only excuse for these, Andrea! A Perfect 10 El Guapo. Magnificent in spades! The hepcat choir is in, edrevets. Going for that immersive effect, because The Man don’t like it, therecoveringbrit. Next one will have a drummer! Way cool man. ;). I could see it so perfectly. You need a Starbucks to perform it in. Starbucks is a capitalist hegemony set up to perpetuate the yoke of The Man around our necks, life is a bowl of kibble. I only drink free range organic coffee picked by new-age virgin albinos. Perfect. I felt and saw every word. Well done! I think the best way to claim items is through poetry. Or song – like in Disney! You’re the daggingest digger there ever was, lizzie c.
Hehe. Men and taxes never change. 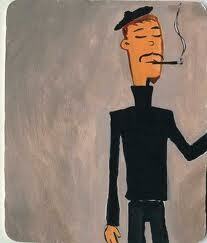 Hey dude … you’re so cool because I haven’t heard the word beatnik since Maynard G Krebs on the Dobie Gilis Show. I have read both Dobie Gillis and The Many Loves of Dobie Gillis. I am lonely. It’s really hard. Hah – makes me wonder how much of that (especially the end of the movie when he does it on stage) was in the back of my head. Next one was already scheduled to have a drummer written in. You always have the movie refs ready, ODNT! My husband is master of the remote. I get too stressed out. It’s one of those fancy, over-complicated kinds. I just can’t handle it :). The extra buttons are just The Mans way of keeping us down, Erin! Ah ha! I am totally on to you! This Beatnik Poetry Slam is really just an excuse for you to wear Ray-Bans night and day. You’re THAT guy. Nonono, I’m the guy that gently mocks the sunglasses at night guy.